I knew this day would come. I knew that my clumsiness would eventually show itself. It can only stay hidden for so long. When my uncoordinated nature comes out, there isn’t just one tiny incident of tripping up the stairs or bumping into the coffee table. It consists of a day’s worth of clumsy moments. Each one slightly more embarrassing than the last. Earlier in the day on Monday I’d been brushing up against every possible piece of furniture in my path (it’s no wonder that I have a collection of bruises that I can’t explain). Therefore, Monday night’s plate incident came as no surprise. I now have one less plate in my cabinet. Said plate has been transported to the garbage where it will reside for the rest of its days. As for me, my (accidental) plate throwing spell is over (I hope). There wasn’t even anything I could have done to save the plate. As soon as it left my hands and shot through the air I thought, “Man down.” It was as if the action was unfolding in slow motion, but I still didn’t even have enough time to reach out for the plate to try to save it. It hit the ground. White pieces of glass went flying under the chair, into the kitchen, and under the end table. It was like a scene from My Big Fat Greek Wedding, except for that my plate smashing was unintentional. After cleaning up the mess, I breathed a sign of relief (odd, I know) because for me this moment was inevitable. It was going to happen (I’ve got a history with breaking glasses, bowls, plates, you name it, I’ve probably broken it). The first plate was broken. The mystery of when and how it would happen was over. Now, I can move forward with the five plates I have left. Maybe they can all last longer than this first one (a few months isn’t a long enough life span for a plate). Yet again, I’ve rambled on about the small moments of my life. All of which have nothing to do with the recipe found below. 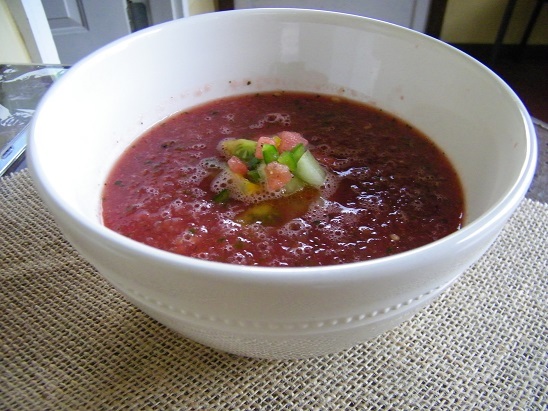 The watermelon gazpacho was not the culprit of the incident. It was however, very delicious and slightly more notable than my plate dropping accident. Sweet, spicy, and savory are all words that could be used to describe this cold soup. Enjoy! Add all of the ingredients to a food processor and blend on high until the soup is smooth. Chill the mixture for 20 to 30 minutes in the refrigerator. Serve immediately and enjoy! Optional: I made a fresh salsa out of the leftover ingredients (cucumber, watermelon, tomato, cilantro, and lime) to top the soup with. A suggested side dish would be jalapeno cornbread. OMG. I have such a passion for watermelon. I’m def going to try this recipe while it’s still watermelon season. Time is running out! Please do and let me know what you think if you get the chance!